Just three days ago, I posted that AB 51 had passed the full Senate, and here we are, closing out the week with more good news—AB 51 achieved concurrence in the Assembly yesterday, 74-0. Yeehaw! Here’s video of Assemblymembers Quirk and Lackey discussing the bill in the Assembly, along with the vote. So AB 51 is on the home stretch, headed to Governor Brown for signature. The best thing to do now to ensure that signature happens is to send a support letter to Quirk’s office—his staff will be compiling all of these letters to share with Brown. You can download a sample letter here—personalize it as you like, share why lane splitting matters to you. Send it to Quirk’s Chief of Staff, Tomasa Dueñas at Tomasa.Duenas@asm.ca.gov, by Wednesday, August 10 at 12pm. Thank you! ‹ AB 51 California Lane Splitting Bill Has Passed The Senate! Surj, letter written, scanned, and emailed. Thanks for all your hard work on this. My pleasure! Oh, just ordered a sticker pack too. Great job! 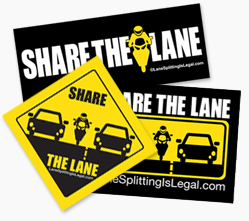 I will buy a package at least and tell my friends to do so, is any way I can embed your “get your lane splitting stickers here!” on my website? Thanks! No, sorry—don’t have an embed. Great work! Hopefully this will set a precedent which other states will take notice of. This has not happened yet, and as you have said repeatedly, Lane splitting is already legal, since it’s not illegal? Maybe we should sandblast all the lane markings off of our highways so there’s no lanes, just pass whenever, no signaling required, speed will replace safety and your “because I can mentality” will prevail! Hi John. Just to clarify, anything that is not codified as “illegal” by statute or regulation is, by definition, legal. Under current California law, lanesplitting is not codified as illegal, therefore legal. What this law does is define lanesplitting and allow the CHP, with the assistance of other agencies, to develop educational guidelines for the practice. With that said, if you are truly opposed to AB 51, I encourage you to send a letter of opposition to Tomasa Dueñas. Take care. The guidelines were taken off the CHP & DMV websites, there are no safe guidelines for lane splitting, you’re talking about trying to chance people’s attitudes and that my friend is not going to happen. As of now, letters have been written to help enforce laws already in play, and develop new guidelines on how to enforce them. RIde safely, don’t lane split, the life you save may be your own! Once signed by the Governor, the safe guidelines will be re-added to the DMV and CHP websites. What we’re talking about is improving safety for motorcyclists in California and hopefully encouraging other states to follow suit. Ride safely, split lanes safely, the life you save will be your own!